9/11 memorialized in real-time: Why do we keep reliving those ‘102 Minutes That Changed America’? Why Do We Return to Live Footage of 9/11? Why do we keep returning to these horrifying minutes? Tonight, the History Channel will mark the eleventh anniversary of the attacks on the World Trade Center by re-airing 102 Minutes That Changed America, a present-tense documentary—no narration, no talking heads, no rear-view analysis—assembling footage from more than 100 New York eyewitnesses with cameras (most of them amateurs) in real time. “9/11 as it happened” programming has been fairly common in the years since 2001. MSNBC marked the occasion Sunday, as they have every year, by re-airing the NBC news coverage from that morning, while Fox News repurposed their coverage of the day (along with other archival sources and interviews) in the 2011 documentary “9/11: Timeline to Terror,” which ran Sunday evening. These programs and others are a part of our continuing attempt to grapple with 9/11, and they raise a simple but difficult question: Why do we keep doing this to ourselves? We watch that horrible morning play itself out again, year after year, one inevitable event after another, helplessly gasping, crying, or screaming at our televisions, knowing that nothing we think or do or say will change a thing. 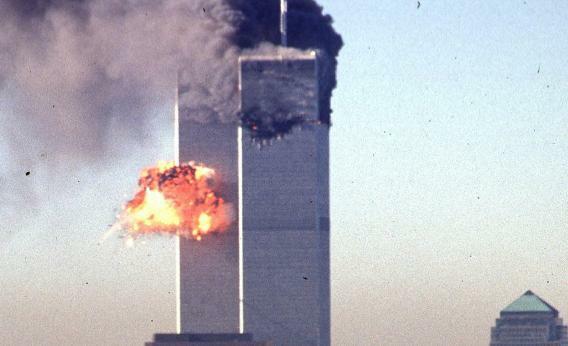 The second plane will crash into the second tower, which will collapse 56 minutes later, and then the first tower will collapse 29 minutes after that. Watching those buildings crumble and take the lives of thousands of Americans is something akin to watching a snuff film. Reliving it all—our last moments of cheery obliviousness, the confusion of those first reports, the utter despair of watching those buildings crumble—is borderline masochistic. Isn’t it? We’ve seen a more famous image elsewhere of the second impact. It’s a low-angle shot of a man leaning on the hood of his car as the plane hits behind him. The filmmakers had access to that shot (they used other footage from the same professional photographer), but they didn’t use it. Instead, they went with the raw terror in the apartment of those two young women, because we all had that moment of clarity and comprehension, and all reacted, at different volumes, in much the same way. So, then, why are we watching? The answer is sad, perhaps, or ghoulish, or at the very least difficult to admit. But in the aftermath of 9/11, in the rush to understand that day (as if such a thing were possible), it became a historical event, a thing in the past. As it got further behind us, it became almost an abstraction. In the decade that followed, September 11 was co-opted by politicians and xenophobes and warmongers and sloganeers and conspiracy theorists, and it became such an all-purpose placeholder for any number of vile notions that one can easily lose the ability to separate it from the fiction it was manipulated into and acknowledge it as, simply, this horrible thing that happened to us. The power of these programs is their immediacy—of a history that is not yet written, one that’s visceral and terrifying, yet one that allows us a present tense in which we can feel something genuine.